Purchased on a grant provided by the Bernard H. Breslauer Foundation and with a gift from Marguerite Steed Hoffman, member of the Visiting Committee to the Department of Medieval and Renaissance Manuscripts, 2017. One of four leaves removed from MS M.1003 sometime before 1909 (date of the Robert Hoe catalogue; this leaf was originally between the present folios 14 and 15). The manuscript belonged to Frédéric Spitzer (1815-1890; La collection Spitzer: Antiquité, Moyen Age, Renaissance, Paris, 1890-93, V, Miniatures et Dessins, no. 5, which describes the manuscript's having 17 [as opposed to the present 16] miniatures, which means that the leaf was possibly still in the codex in the 1890s); this leaf bought at Leipzig, C.G. Boerner, 9-10 May 1930 (Handzeichnungen des XV. bis XVIII. Jahrhunderts), lot. 254 ("Sammlung: Spitzer"), Taf. XXVIII, by Trier; sold at Bern, Kornfeld & Klipstein, Auktion 114, 16 June 1965, lot 52, illus., by Trier; bought by a Munich private collector; inherited by a descendant; bought by the Morgan from Jörn Günther, 2017. 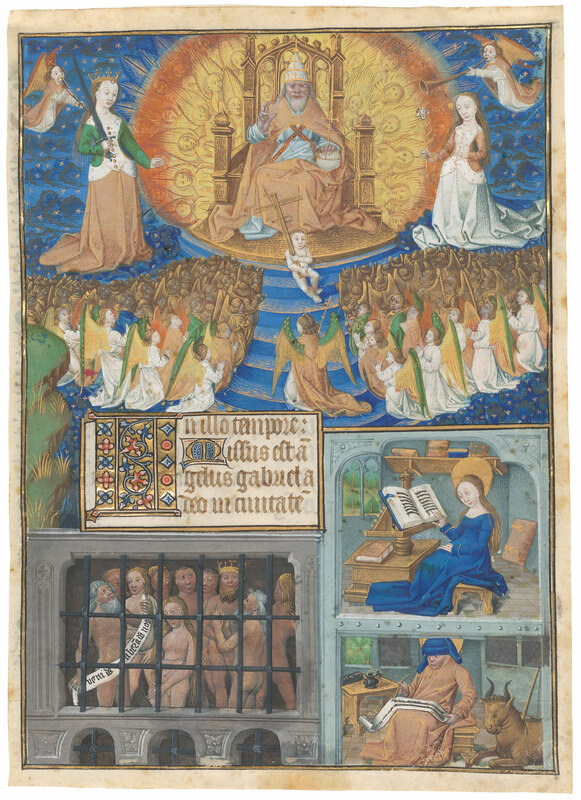 A single leaf with a four-part miniature depicting, in the top half, the Parliament of Heaven, in which God the Father, flanked by reconciled personifications of Justice (with a sword) and Mercy (with a lily) has decided to redeem mankind; at his feet the Christ Child, holding a Cross, waits to be dispatched to earth preceded by the Angel Gabriel, who stands in front of Jesus. At the lower right sits the Virgin Mary who, unbeknownst to her, is about to conceive the Savior of the World. Below her sits the Evangelist Luke, author of the Gospel Lesson. To the left is Limbo containing the just souls of the Old Testament awaiting release by Christ. This leaf comes from Morgan MS M.1003. It is one of four miniatures that went missing from the codex sometime before 1909. The present leaf, M.1207, is the first, originally falling between present folios 14 and 15. The second, St. John and the Virgin with three border roundels for the "O intemerata," originally between folios 24-25, is now in Amiens, Musée de Picardie, Inv. MP 999.1.226, collection A. Maignan (see Lille, Palais des Beaux-Arts, Jan Fabre: Chalcosoma (2006-2012), Hommage à Jérôme Bosch au Congo (2011-2013). Illuminations: Eluminures, Trésors enluminés de France, Lille, 2013, 198, no. 7). The third, Flight into Egypt for Vespers of the Hours of the Virgin, originally between folios 97-98, is untraced. The fourth, Trinity for the Seven Requests to Our Lord, originally between folios 217-218, is in a New York private collection. Associated text: Luke 1:26-30, the first part of Luke's standard Gospel Lesson that traditionally appears in Book of Hours (Luke 1:26-38). Decoration: 1 four-part miniature surrounding the incipit of the text on the recto (text continues on the verso). Artist: Master of Jacques de Luxembourg.